How can disaster be beautiful? Dare to find out. Currently on view in McCabe Library atrium until February 20, J. Henry Fair’s “Extraction and the American Dream” is at once breathtaking and shocking. The exhibit is comprised of a series of photographs of potentially environmentally harmful activities such as hydrofracking and coal mining and environmental disasters such as oil spills, but the artist has created incredibly beautiful images of these activities and conditions. The colors and forms in the works are stunningly intricate, ranging from brightly saturated to muted and heavily delineated. 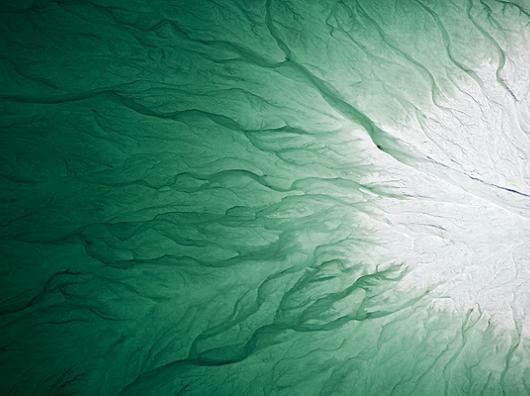 The photographs, taken from above via airplane, are well composed with a sure artist’s eye. J. Henry Fair has been a longtime environmental activist and artist. Although his family was not involved in any type of environmental activism during his youth, he developed his own keen interest in the environment and began photographing areas around the Mississippi River. He soon found that an aerial view of disaster sites provided amazing visual fodder and realized that he could spread his message about the destructive tendencies of our consumer society through creating visually arresting works. And visually arresting they are indeed. These photographs are impossible to miss. Fair uses the strange, unearthly beauty of these disaster sites to draw in the viewers and to demonstrate the impact of such environmental catastrophes as the British Petroleum spill of 2010. 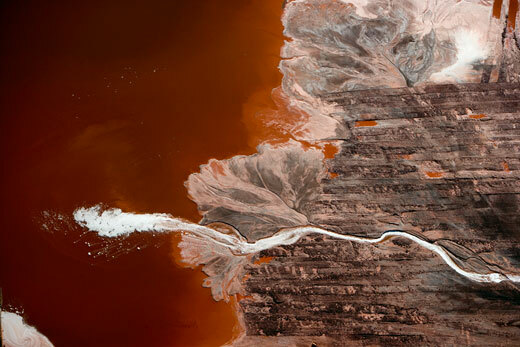 Incredibly enough, Fair does not photoshop or invent the colors in any of the photographs he takes of these often hard-to-find sites; aside from some playing with the contrast, the photographs reflect the truth of what he sees from the plane. Every work in this show is noticeable and often luminous. My personal favorites in the show include “Untitled”, which depicts in rich blues and greens of a wetland next to an oil refinery in Mississippi; “Expectoration” (pictured below), which depicts aluminum production waste disposal in Louisiana with a sort of eerie serpentine form emerging into a sea of rust red; and another “Untitled”, which depicts a rainbow of oil in the dark blue waters of the Gulf of Mexico during the BP spill. Out of context, these photographs appear abstract and unrecognizable. It is only when we see the title card and blurb about each photograph that we understand the true nature of the works. These works are not by any means the only standouts. While the atrium is a difficult space in which to hold a cohesive exhibit due to its fragmented and octagonal nature, placing these eye-catching works in a commonly used location where they will be seen by hundreds of people daily means they are sure to have an impact. Fair’s works not only stimulate our eyes but also challenge our minds and our ways of being. If somehow my fellow Swatties have no plans to go to McCabe during his residency on campus, I recommend making the extra effort to go in and study these works of art. For those people in the area who want some activism with their art, I also recommend this show. My interview with J. Henry Fair can be found here. McCabe Library is open 8am-2am Mondays-Thursdays, 8am-11pm Fridays, 10am-8pm Saturdays, and 10am-2am Sundays. This is an excellent exhibit review! You do a good job of providing context, both in describing the artist's background and the circumstances surrounding the photos themselves, as well as describing the message evoked by the artwork. Nice!